Last week in the Guardian, journalist Sam Leith wrote in praise of “difficult” novels. The piece was in response to coverage of this year’s Man Booker prize winner – Anna Burns’ Milkman – which some commentators have described as “challenging”, “brain-kneading” and even “impenetrable”. It got me thinking about “difficult” theatre. As with the novel, the difficulty in theatre is frequently bound up with form as much as it is with content. That said, when innovative theatre is misunderstood, or deemed knotty, it is often down to a mixture of both. It is no surprise that Sarah Kane’s Blasted caused critics to scratch their heads or why Samuel Beckett’s Waiting for Godot, in which “nothing happens. Twice”, can sometimes feel hard to watch. At least in a less-than-razor-sharp revival. One of the Booker judges agreed that Milkman was challenging but said he meant it in the sense “that a walk up Snowdon is challenging. It is definitely worth it because the view is terrific when you get to the top”. That’s true in theatre too. I often sit through shows I don’t actually enjoy much in the moment, but which I appreciate afterwards. I have sat through many long shows with moments that feel like I’m in purgatory. But some, if not all, have more than repaid the investment of energy, time and attention. Only the other week I came out of a show with a friend who turned to me and said: “I am not sure I understood that, I often didn’t like it, but there wasn’t a moment when it didn’t interest me.” That strikes me as quite a compliment. I’m a sucker for the production that makes you float out of the theatre on a giddy high as much as the next person. I recall many years ago describing The Donkey Show – a musical version of A Midsummer Night’s Dream – as “Pot Noodle theatre”. But, hey, sometimes what you really crave is a Pot Noodle. There is absolutely nothing wrong with that, or in giving people a show they are really going to enjoy. Doing it well is as much an art as staging a play by Martin Crimp or Caryl Churchill at their most deliciously elliptical. But I also think there is something enormously satisfying about watching a piece you don’t find easy and trying to work out what it is doing and why it is doing it in the way it is. It has taken me a lifetime of theatregoing to learn the vocabulary of a company such as Forced Entertainment and it has been an invigorating journey with moments of puzzlement along the way. 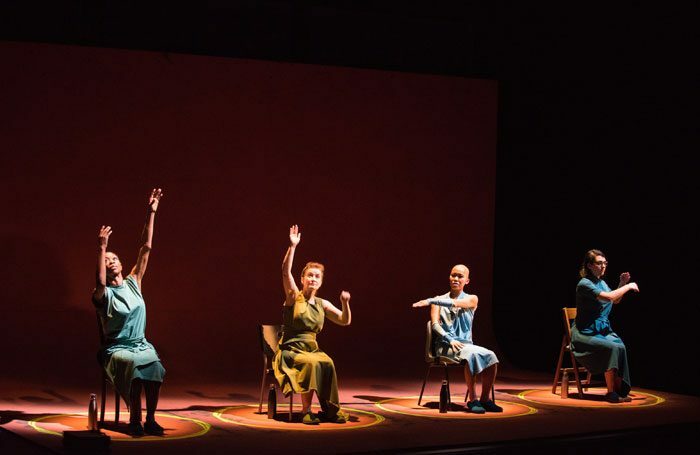 Last week I saw two shows in London – Sue MacLaine’s Vessel at Battersea Arts Centre and Chris Goode’s Mirabel at Ovalhouse – that taxed me in different ways, in both cases because of how they married form and content. Goode’s Mirabel is an apocalyptic fairytale, which, through brilliant design, sound and lighting, takes you deeper and deeper into the unconscious. I found MacLaine’s knotty Vessel, which examines the power of language, hard to sit through, but its sharp intelligence and elegant formality has stayed with me, just like a piece of music by Bach. A week after seeing it, I’m still working it out. A week after seeing most theatre it is already forgotten. These are both theatremakers who have spent time and care thinking about why the shows they are making must take the form that they do, a form that reflects the complexity of the ideas they are exploring and the world they are holding up to the mirror. Everything they do is for a reason. Sometimes, when I am watching something I don’t have a handle on, I find that myself asking the questions ‘Why are they doing that?’ and ‘Why at this particular moment?’ is a good way in. The pieces start to fall into place. Let’s be clear: by ‘difficult’ I don’t mean the kind of jokey erudition and knowingness that you find in the plays of Tom Stoppard; work in which an audience can pat itself on the back for getting a reference, and therefore the joke, rewarding though that can be. Difficult theatre is seldom show-off, look-how-clever-I-am theatre; it is mostly quietly unassuming but has a complexity that demands deeper attention. It’s like discovering an itch you need to scratch: sometimes painful but also enormously satisfying.